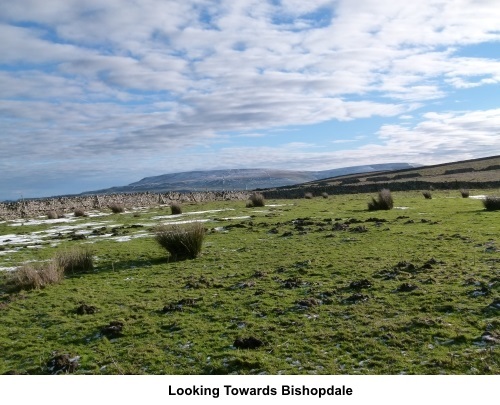 OL30 Yorkshire Dales – Northern and Central area. 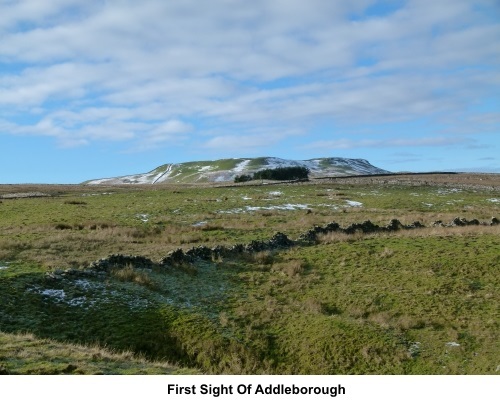 Introduction: If, when passing through Wensleydale, you have ever spotted a distinctive, flat topped hill with steep stone cliffs, the chances are that it will have been Addleborough. Its prominence, at 1575ft (480 metres) led to it being used as a lookout station by the Romans and before them, Bronze Age people buried a chieftain there beneath a stone cairn. 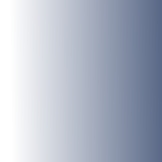 Remains have been found to support all this. 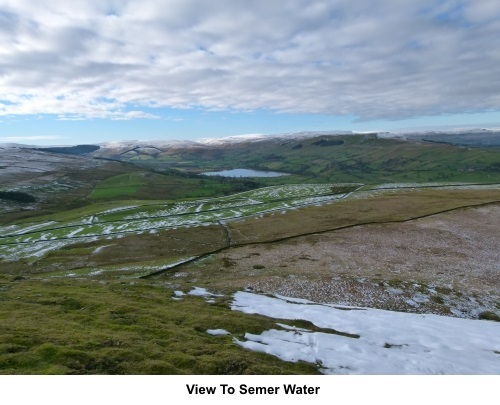 From its summit, there are great views all round, not least looking down to the pretty lake of Semer Water. 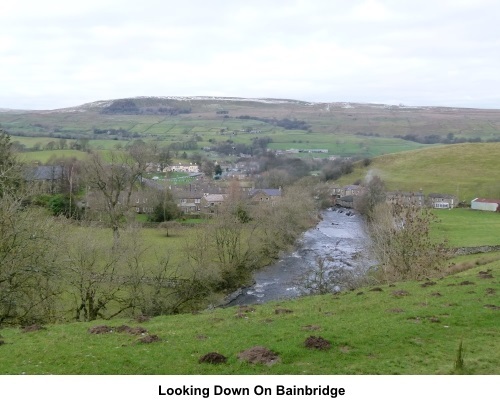 A bonus of this walk is that it incorporates the lovely village of Bainbridge, not surprisingly on the River Bain, reputedly the shortest in Britain at two and a half miles in length. 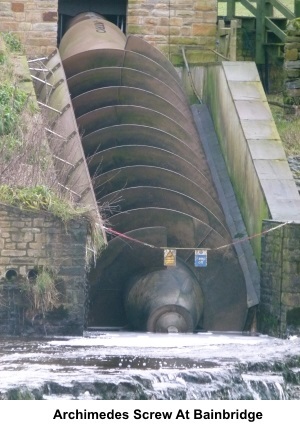 By the river is a huge Archimedes Screw installed in 2011 to generate hydro-electricity. The village has a very pretty centre and village green with stocks – so behave! Consequently, it is something of a “honeypot” village which can get very busy with visitors at peak periods. Refreshments can be obtained at the Rose and Crown Hotel – great pies! 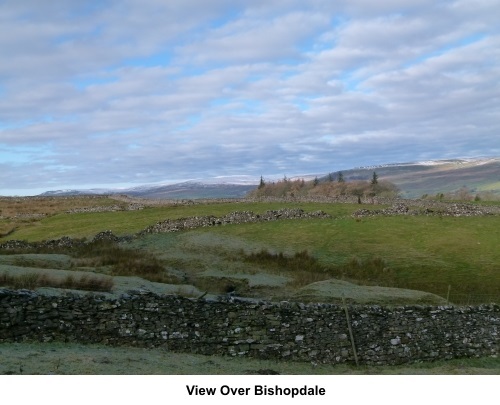 The walk follows a route over Access Land, so not all of it is marked on OS maps. However it is mostly clear on the ground. The walk is straightforward overall with just a short steep climb to the plateau. The tricky part is finding a safe descent from the top. The route I found is detailed below but you need to be careful and take time to find it. Probably not a walk for anyone who has vertigo issues. The return from Bainbridge is mostly level. There is around two and a half miles of road walking on this route but this is on very quiet lanes and the views are very pleasant. The first section, over a mile long, is a “dead end”. I saw no traffic at all when I did the walk. The walk starts from the attractive village of Thornton Rust. 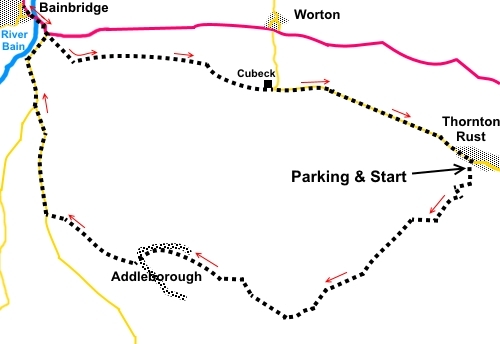 To get there, turn south off the A 684 at either Aysgarth or Worton, where signposted and follow the minor road to it. There is a free “car park” indicated by a blue ‘P’ sign in the village but this is little more than a bit of rough grass. Do not cross the stream at the end of the parking area by mistake as there is no-where to turn round beyond. Start: From the parking (SD 972888), cross the stream and take the left fork along the broad, walled track. Follow this track past a stone barn and crossing a ford via some conveniently placed elevated slabs. Stay on the track for about another 150 yards and as it opens into a field, take the path on the left (SD 967884). Continue on the path for about three quarters of a mile to cross a ladder stile. Shortly after this, is a finger post where the path forks. Take the right fork following the “Permissive Footpath” fingerpost and cross another ladder stile (SD 956876). The path starts to climb gently and you arrive at a large rock (SD 953879). From here, the path becomes indistinct. Simply head directly uphill to reach the plateau. 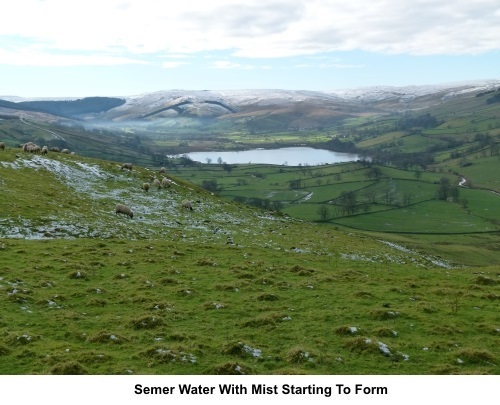 From the edge of the plateau, bear right to a ladder stile which is visible, along with the top of a cairn, peeping above a wall. Over the stile and you will note the cairn is more robustly constructed than the majority of cairns. It does not mark the summit however. 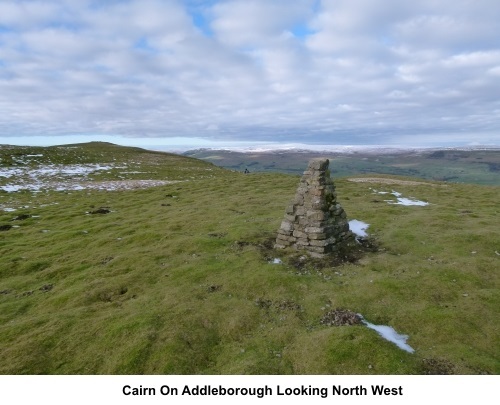 From the cairn, continue in the same direction as your approach to a marker post. From the marker post (SD 947881), bear left (278 magnetic) towards the true summit where you will see a few rocks. Which are supposedly the remains of an ancient cairn. Some have cup and ring markings. There are also traces of an old Trig. Point. 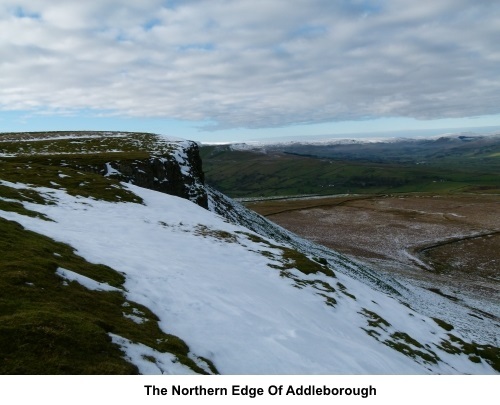 From here, for the best views, follow the edge of the escarpment indicated by the rocky bluff but beware of the steep drops. You come to a fence (SD 944881). Follow this along to the left (south) but you need to stop about 50 yards before the corner where the fence turns left (east), to find the way down. This is not easy to find. My first thought was to climb down the rocks but many at the edge looked cracked and not too secure and did not appeal as a potential descent. About 50 yards before the corner, hop over the fence. Here, there is a more grass slope descent, which went slightly left and which I was able to descend without too much difficulty. I give the full OS reference from my Garmin in case you have the equipment - SD 9441588049. 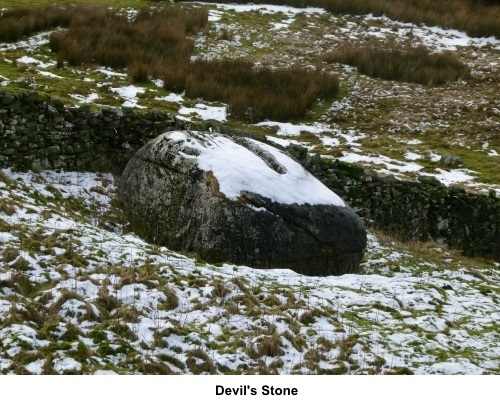 Below, near the wall is a large boulder known as The Devil’s Stone arising from one of these folklore tales about giants and the Devil throwing stones at each other. Also below, in the rough pasture, there was a clear track across the field, created by a quad bike/tractor, which is the onward route. Of course I cannot confirm this would still be visible at a different time but it looked well used. If in doubt, head for the wall at the bottom of the field and turn right to follow it along. Turn left at the wall corner and join the road. Turn right along the road. Just past a telecommunications mast, turn right at the road junction. At the ‘T’ junction with the A684, turn left for Bainbridge. 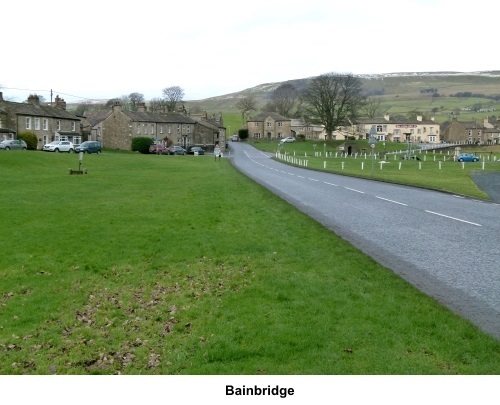 After Bainbridge, return to this point or, if not venturing into the village, take the narrow gated stile which leads from this junction to “Cubeck 11/3 miles”. 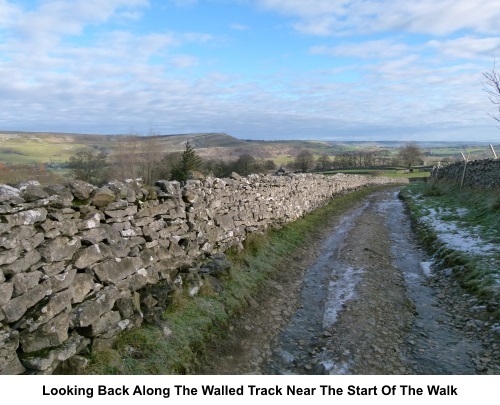 The path goes through a gated stile which you can see, then bears right to another stile which you can just make out at the top of a grassy slope, leading to the top of Brough Scar. Go through this stile and turn left. 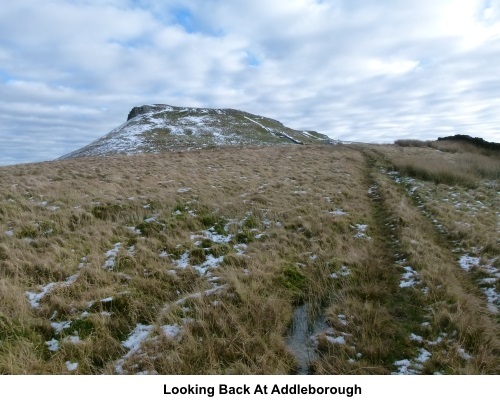 The path now follows the top of Brough Scar. Ignore any turns off left. The path is level and easy to follow, defined variously by gated stiles and yellow markers. At SD 945897, pass a three way fingerpost and continue ahead following the public footpath sign. Later, pass another three way finger post and follow the sign for “Cubeck”. At the farm at Cubeck, the path passes to the right of the main farm buildings. At the road, turn right and follow the road back to Thornton Rust.